This is it! After days of being offline from a relaxing yet long trip in Mambukal, Bacolod, Negros Occidental, my keyboard is now ready for my fingers for the story-telling. LOL! Sorry for the long wait, but the first two “Link”commentors deserve a prize from me! Our assembly time is around 10:00 am at the Etel Lobby in I2 Bldg., Asia Town IT Park, Lahug. We were waiting for our team mate to log out by 10:00 am. Thirty minutes after, we headed off to Citilink terminal where transportation vans are set ready to take us to our destination. Van’s Fare from Cebu city to Toledo city is Php 120. We passed the Cebu South Road Properties (SRP) going to Toledo’s terminal where it took us an hour and 15 minutes to travel. We arrived at 12:15 at the Toledo wharf. Unfortunately, we didn’t catch up the fast craft that departed around 12 noon. So we opted to take the LITE shipping lines. We departed around 12:45 pm. We arrived in San Carlos City wharf at 2:45 pm. It’s a 2-hour ocean travel. Enough for us to rest a bit to get some energy on the next level of the trip. There are motorcabs and tricycles (sikad2x) waiting at the entrance of the port. BTW, passengers need to walk at a certain distance to the port’s main exit. The wharf’s area is so spacious that it’s like an airport. Really! We spared around Php 10 for the cab’s fare leading us to their bus and van terminal where the transpo going to Mambukal awaits us. We made negotiations on the van’s fare. There were 11 of us and we spared Php 155 for the van’s fare with the assurance to bring us to Mambukal. If you think the fare is costly for you. You can request to be dropped at the town of Murcia’s crossing and there are jeepneys leading to Mambukal as well, fare is Php 15. As a suggestion, it’s good if you go to Mambukal in large groups, say 10 to 15 peeps. You can have the van exclusive for your group. The many, the better, the less money you spent. Very economical! After an hour and 30 minutes of travel passing through the mountainous highway of San Carlos city, we finally reached the heaven’s resort of Mambukal. It is also a 35-minute drive from Bacolod city. - My team mate book the dorm-type room for only Php 2,000 that could house 20 persons. They have 10 double-deck beds to accommodate large groups. For the facilities, a ceiling fan and a stand fan are provided each room. We don’t mind if it’s not air-conditioned as it is cold at night time in Mambukal. There are 2 separate comfort rooms for males and females though it’s common to all tenants of the room. - The have also duplex-typed rooms. You may have the option to choose a room good for 4 or more. It is already equipped with lavatory, bathroom, toilet, cabinets. This is good for families on vacation. - A tourist lodge is also available in either standard or suite rooms. We still have time to stroll the resort for some photo clicks on some nature spots it has to offer. You can enjoy watching flying bats soaring up high or see them sleeping on tree branches. There is a rocky creek within in the resort that adds its picturesque view. 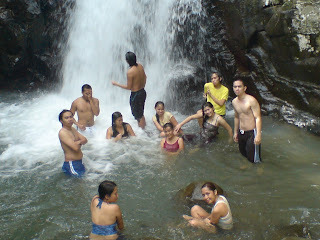 It comes from the seven falls of Mambukal where a stream of cold water flows. - We took our dinner at ENTENG’s. Food prices are affordable. It ranges from Php 45 to 150/meal. We ordered Sizzling squid (Php 65 to 150), Sigang na Tangigue (Php 120), Grilled squid, pork, chicken (Php 65), 2 sticks of pork barbecue (Php 45). And free ripe mangos for our dessert. We also ate the leche flan we bought from our fellow tech agent in Etel. - At breakfast, we had it at Ikea of Kabankalan. We ordered the common breakfast meal like longganisa, egg, corned beef, bacon, bihon. It’s Php 55/meal with coffee already. - There are picnic huts and cottages located side by side in between their wide swimming pool and boating lagoon where you can grill you own food. Perfect for those spending time with their families and friends on a Sunday. - Mambukal has 7 majestic falls that you can see and feel it’s dripping cold waters and named as First Falls, Second Falls and so on. We had a 30-minute walk to the first falls passing those grassy, slippery clay soils of Mambukal. We hurdled, climbed and all sorts of mountain trekking activities you can think of. Passing through rivers is fun and lets you think you are one with nature. It’s definitely a fun experience. We had a tour guide provided by the resort. And note it’s up to you to give a tip to your guide. In our case, we contribute Php 20/head. - Outside the food court is a man-made wall for you to climb. LOL. I don’t know how much is the charge but I think it may range from Php 30-50 complete with the gear. The person in-charge on that time is not around so we manage to take some snap shots bare feet! Wahahaha. - Within the resort is warm dipping pool with sulfuric soda water that would rejuvenate your body. It’s like you’re in a sauna bath. Very therapeutic for those people who experienced some body fatigue and stress. It soothes your mind, body and soul. We went there at night, perfect before going to bed. We had a relaxing and calm sleep that night! Entrance fee: Php 30. - The resort has a huge, wide swimming pool for children and adults. You can have your lunch picnic at the side. Entrance fee: Php 50. - It is a very scenic, perfect for camshots. Renting fee for the boats is Php 30/head for an hour. Each boat could accommodate 2 persons. You will be geared with a life jacket for safety. - It is just a few meters walk from the boating lagoon. Though we didn’t went inside to see the garden, a small souvenir shop at the entrance would invite you to buy some real butterfly stuffs. Entrance fee to the garden: Php 30. Slide for LIFE, Canopy Walk, Conference hall, Ishiwata camping ground, Coffee shop, Standard and Deluxe lodges and cottages. After the breathtaking escapade to the falls, we set ourselves to the boating lagoon, then to the butterfly garden. We took a shower, pack our things for our departure. We check out of the resort at 12 nn. The jeepney that brought us from the resort to the Murcia where we waited a bus (Ceres liner) is literally slow. We thought that raising our fare from Php 10 to Php 15 would pacify the speed, but unfortunately, NOT! That disappoints me! Reason is, the driver is eyeing for probable passengers waiting along the roadside which is certainly not acceptable to us! Would you expect passengers in a long-stretch of sugarcane land?! At least, the driver should push the speed faster. Expectedly, we butted words out not pleasing to anyone’s ear! It’s literally slow! We rather walked then! Got no choice but to leave our butts in the seats. Traveling through Ceres Bus Liner going to San Carlos City took us an hour and thirty minutes. Fare is Php 80. We arrived at 3:30 pm and had 15 minutes left to get our tickets for the fast craft scheduled to take off by 3:45 pm. Good thing, Bong-Bong’s delicacy shop is just around the corner. So we managed to buy some pasalubongs. Upon arrival at Toledo city, we ate in Jollibee as we never had a chance to eat our lunch as we are rushing for the last trip of the fast craft. Going home to Cebu City, we took a van for Php 120 to the Citilink terminal in the city and headed to our repective home sanctuary. Note: The first 2 to comment with this link entry of mine in their post gets some prize from me! Go!!! "the first 2 commentors on my entry with a link back to my post wins some goodies from Bacolod"
thank you so much! looking fwd on your next post... have fun! Where is the link to my post? If you made an entry with a link to my post, pls comment back and kindly send me your email as well. Thanks for your detailed informations. After our Camiguin adventure this coming October with my bestfriends, maybe Negros Occidental is our next stop. "Mambukal Experience" is my much awaited adventure after the year ends. ok na ba yung 2nd repeated comment (with link) na pinost ko? i hope so ;) looking forward to your pasalubong... how nice of you! my oh my, you are quite the blogger, x! what a very detailed entry! i could never have the patience to write something as long as this after taking a trip! i think you should be a travel writer!? haha! anyways, bisag ulahi ko sa comment, ok lang. i really thought you'd go up 'til you see the 7th falls! hehe and barato jud inyo room. wa ko ka try sa boating and butterfly thing, though. maybe next visit to mambukal nalang! I guess, you're the first commentor to get it right! I have read your own entry "i also made an entry about this trip: http://simplykat.blogspot.com/2008/08/mambukal-trip.html"on your site with a link back to mine and it is perfect! Thanks! And you deserve a prize from me!!! CONGRATZ!!! lol. this is my 3rd THANK YOU message. thanks! at first naglibog ko sa instruction x. i thought ang link is in the comment that i'll make in this post.. w/c i think what the others are doing. hehe but i remembered your previous contest.. similar mechanics ra diay! looking forward for more giveways! "Wow! what a beautiful place.... I always wanted to go places like mambukal." @genevive: It was in deed a good place to relax. You will feel you're one with nature. Hey, with regard to my contest, you have to create an entry on your site and you have to post a link with my entry in it. Only KAT made it. But you still have the chance. "very interesting place... detailed talaga huh"
@Virlyn: Yes, it is. So other people may have an idea on what to do and what to expect in goin there. Hey, if you have a website, pls. make an entry about my Mambukal experience with a link to my post. Then, I might give you some prizes. ok? "Thanks for your detailed informations. 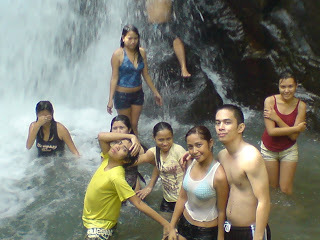 After our Camiguin adventure this coming October with my bestfriends, maybe Negros Occidental is our next stop." Hi this is Nick of adobongblog! Thanks for dropping by. Aliw ang mga pangalan ng blogs mo ah. Who would have thought of Foodelity and Tech-a-lang? Ang galing! I have never been to Negros and Bohol. Nice photos! I will link you up as well. Thanks again! By the way, taken na ba ang domain name mo? I suggest you buy it already before someone else does. .com or .net will do nicely. You can buy it from within blogspot.com! Mura lang. All you need is a credit card. Good luck! "Aliw ang mga pangalan ng blogs mo ah. Who would have thought of Foodelity and Tech-a-lang? Ang galing!" "By the way, taken na ba ang domain name mo? " @watson: Hindi ko pa nabili... any idea, how much? I dropped my credit card last year kc. I;m getting a new one. Pls. send me any detail info at admin@obnoxiousqueer.com. Thanks! you should try that credit card thing. i really wanna try purchasing stuff online but i'm too paranoid i'd be a victim of credit card theft or something. "SHE" na ka ron, teh. korek! it's what's in the heart that matters! You're welcome! Yeah, there's more! So keep posted! Hope you enjoyed the pasalubong. Have you took photos of it? Mambukal was one of the places I visited when I went to Bacolod. I've to say that I had a lot of fun looking at your many photo opps! LOL. I love the bit in the wall climbing area. Haha. Great post.. We like of planning to go to that place soon in the future.